The LORD prepared a great fish to swallow up Jonah, and Jonah was in the belly of the whale three days and three nights... Then Jonah prayed to the LORD, his God, out of the whale's belly... The LORD spoke to the fish, and it spit out Jonah onto the dry land. The word of the LORD came to Jonah the second time, saying, "Arise, go to Nineveh, that great city, and proclaim to it the message that I give you." Jonah 1:17; 2:1; 2:10; 3:1-2 NHEB. Previous Bible study lesson: Crossing the Red Sea #6.03. 2) Where was the city of Nineveh? 3) What nature miracle(s) did God's power unleash in the story of Jonah? Do you believe in the Jonah Bible story? Jesus did - He believed the account of Jonah and the Whale. Why? Because it pointed to him and his resurrection. God performed these great miracles to lead our eyes to the coming reality of the Christ's death and resurrection. You're going to love this jam-packed lesson about God's miracles, his love, and his Son's life. Let's begin. What better place to begin one of my favorite Bible stories than asking, "Who was Jonah?" First of all, the name "Jonah" means "a dove" which holds significance to Jonah's task that we're about to discuss. Jonah was a Hebrew prophet of God who was the son of Amittai (Jonah 1:1) from the town of Gath Hepher, Israel. Jonah lived and prophesied in the Northern Kingdom of Israel during King Jeroboam II's reign, which lasted from 793-753 BC (2 Kings 14:25). The Jonah Bible story was written by Jonah shortly after his mission trip to Nineveh, around the year 760 BC. Nineveh was a city originally founded by the great warrior hero Nimrod (Genesis 10:8-12 ESV). It grew into the largest city in the world, but met its permanent ruin in 612 BC, due to an onslaught by the Medes and Babylonians. This destruction was actually prophesied by the Bible prophets, Nahum (Nahum 2:8-13) and Zephaniah (Zephaniah 2:13-15). Where was the city of Nineveh? Nineveh was the large capital city of the ancient Assyrian Empire. It was situated northeast of Israel. Ancient Nineveh was nestled within the current national boundaries of N.W. Iraq. The Hebrew nations of Judah and Israel despised the Assyrians, including the Ninevites, because they were heavily taxed by their kings. 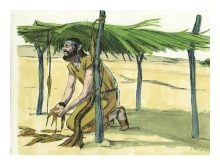 The financial burden agitated the common people, including Jonah the Prophet. The true Bible story, Jonah and the Whale, foretells something extremely important about the coming Messiah of Israel. The nature miracles of Jonah's adventure all happened for a specific purpose, which we'll start unfolding now. One day God awoke his prophet Jonah and told him, "Arise, go to Nineveh, that great city, and preach against it, for their wickedness has come up before me" (Jonah 1:2). Before progressing further, we must understand that God has a legal limit of sin that any person or entity, in this case the city of Nineveh, can commit against him. All sin is against God, and all sin is recorded. The moment a person or entity fills up their measure of sin against God it is too late for repentance, and destruction awaits (1 Thessalonians 2:14-16 NIV). 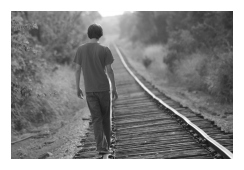 Our personal responsibility is to never cross the line, always being in a state of repentance for our sins. Repentance removes sin (Psalm 32:5). Back to Jonah, he heard the Lord's command to preach to Nineveh loud and clear. But, because of his political hatred for the Ninevites and their city, he ran the other way to a port city called Joppa, so that he could board a ship for Tarshish. He was fleeing the command of God (Jonah 1:3). Jonah fell asleep down in the hold of the ship, and soon God sent a powerful storm to rage in the sea. The terrified sailors knew a divine power was against them, so they drew lots to find out who God's wrath was raging against. The Lord made sure the lots fell on Jonah. The sailors asked Jonah, "Who are you? What is your work? What country are you from? What is your nationality?" 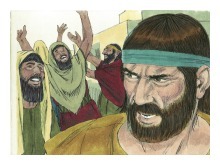 Jonah confessed that he was a Hebrew who was running from the Lord. He told them that the Lord created both the land and the sea (Jonah 1:9). Jonah also showed us that it isn't wise to run from God's calling on our lives. 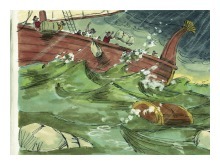 The sailors were terrified because the storm was intensifying and the boat wouldn't last much longer. They asked Jonah what they could do to stop God's anger. 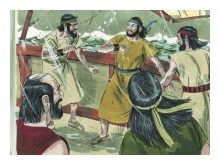 Jonah told them to throw him overboard, but they attempted to row to shore instead. The storm continued raging against them. Finally, after apologizing to the Lord in prayer, the crew obliged Jonah. They threw Jonah overboard, and the storm immediately ceased (Jonah 1:15). They were amazed and worshiped the Lord for relenting from their destruction (Jonah 1:16). 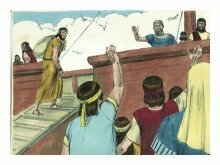 The sailors became believers in God because of Jonah's witnessing. God can do great things through us, even when we're running away from him! Jonah found himself sinking deep into the Mediterranean Sea; however, the Lord had appointed a whale to swallow Jonah whole. Jonah and the whale became travel partners for three days, because Jonah was lodged in the whale's belly. Note: The Bible calls the whale a "big fish," and a whale is a mammal, granted. However, there is no known fish, other than a whale, that could safely swallow and house Jonah in its stomach for three days. Jonah needed oxygen inside the fish's belly, so, the fact of a whale being a mammal makes that much more sense. God specially "appointed" this fish, so whatever type the fish was, know that it was God's chosen fish! Men normally fish for fish, but in the case of Jonah, this big fish was fishing for a man! 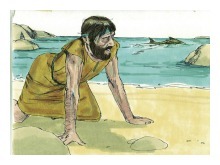 Jonah and the whale were swimming through the sea, and Jonah finally started praying to the Lord after three days. He praised the Lord for saving him from the sea, thanking God for his mercy (Jonah 2:1-9). The Lord wants us to pray to him, too. That means we're to pray for our own repentance. Also, we should be in prayer and supplication for others, all the while praising God for his greatness. God answered Jonah, ordering the whale to spit Jonah out onto the beach (Jonah 2:10 NASB), which he did. After Jonah came to his senses on the beach, the Lord spoke to him, giving him the same orders as earlier, "Arise, go to Nineveh, and preach against their sin" (Jonah 3:1-2). Jonah was now ready to follow God's orders. Jonah entered the walled city of Nineveh and began preaching, "Forty days from now Nineveh will be destroyed!" (Jonah 3:4). Jonah himself didn't want Nineveh to repent, so he was preaching against his own will. The people heard Jonah and they reacted in fear and repented of their sins. They believed God. They fasted towards God, devoting their time to prayer. They placed burlap over themselves to reveal their shame and sorrow for their sin. The king of the city heard Jonah's preaching, and believed it, too. He issued a decree to everyone, which ordered them, along with their animals, to stop eating and drinking (aka fasting). The king told everyone to express their disgust with their own sin, stop the sinning and violence, and pray that God relents from the coming wrath (Jonah 3:7-9). God heard the prayers of the Ninevites, but more importantly, He saw that they stopped their sinful behavior. Because of those two things God relented from sending the planned destruction upon Nineveh. Nineveh escaped the fate that earlier struck Sodom and Gomorrah for their abominable homosexuality. Jonah had climbed a hillside on the outskirts of eastern Nineveh after preaching to them (Jonah 4:5). 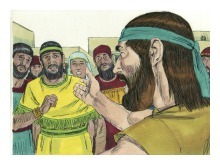 Jonah and the Lord had a revealing discussion while the Ninevites were repenting. Jonah grew hot and weary while sitting on the hillside, because the weather was unbearably hot. 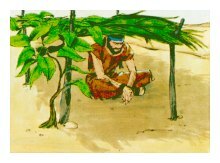 God wished to show Jonah a lesson, so he caused a plant to grow up quickly, in order to shade Jonah from the scorching sun. This was another nature miracle from God, and Jonah greatly appreciated the gift. The Lord then caused a worm to eat through the plant's stem, which killed the plant overnight. Jonah became angry for God's action, because he once again became terribly hot and uncomfortable, so much so, that he wanted to die. The Lord asked Jonah, "Is it right for you to be angry because the plant died?" Jonah informed the Lord, that, "Yes, even angry enough to die!" Jonah proved that our hostile biases can become so deep that even a three day confinement in a whale's belly fails to perfect us. Wow. We have some great lessons to learn from the amazing Bible story, Jonah and the Whale. First of all, we learn that God is the Creator God of the Universe. He created ALL things, both material and immaterial (John 1:3-4). Nature miracles are easy for God to perform because he created all things in the first place! He sent a storm upon the sailors. He sent a fish to swallow Jonah. He sent a plant to shade Jonah. He sent a worm to eat the plant. God orders, i.e. ordains, the things of his creation to perform the tasks he wants accomplished, and those things listen to him. He has given us humans the ability to choose to listen to him, or not. How have you been doing with your responsibilities? Next, God is sovereign over his creation, but, most importantly, over the plan of redemption. God's patience with Nineveh had ran its course because their measure of sin had filled up their cup of wrath. God keeps score. However, because God is merciful, wishing that all men could be saved, he sent one last command to Nineveh. Jonah was told to bring this order of faith and repentance to the Ninevites. Jonah ran from God, but God made sure to complete the assignment he began through Jonah (Philippians 1:6). Are you listening to God's plan of redemption by repenting and believing in him, through his Son, Jesus? Next, God loves people. God doesn't simply love his chosen nation, or those who have already been saved by Jesus. Nope, he loves people, wanting them to be saved. He has so much patience, so much mercy to bestow; but, people have to respond favorably, or God's wrath will finally be poured out upon them. Have you met God's love? Are you sharing God's love with others? Finally, God shows compassion. God has great compassion, not just on people, but as we see here, even on animals! Listen to what he tells Jonah to finish the story. "You have been concerned for the vine, for which you have not labored, neither made it grow; which came up in a night, and perished in a night. Shouldn't I be concerned for Nineveh, that great city, in which are more than one hundred twenty thousand persons who can't discern between their right hand and their left hand; and also much livestock?" (Jonah 4:10-11 NHEB). Compassion is a Christian trait that we must all show towards others, especially those in dire need of life's essentials. Have you been a good neighbor to people in need? That reveals whether you're a true Christian, or not. Do you believe in miracles? Do you believe the Lord, the One who created all things, can easily perform mighty miracles through nature, animals, and people? We have an amazing God who can be trusted. A God who can be admired and respected, even adored. Our God is great and mighty, always merciful, and easily capable of saving us. The same God who showed love by having compassion upon the Ninevites wants you to come to him in prayer and repentance, as well. He wants you to turn from your sin. He wants you to totally believe in him and fear his coming wrath upon sin. Once we hear the gospel that tells us to place our faith in God and turn from our sinfulness, we're to respond. God wants us to emulate the Ninevites. These amazing miracles in this story happened specifically so that you would believe in God. Not only are the miracles critical, but, the example is set forth by the Ninevites. Place yourself there with them. Open your ears to Jonah's message, "Forty days from now Nineveh (YOU) will be destroyed!" Can you feel the command? They believed, fasted, and prayed. They begged God for forgiveness and to relent from the coming punishment. Learn from them. God was pleased with their commitment, and he'll be pleased with your commitment if you follow their example. Jesus tells us to believe, meaning that we're to believe his word about him and his work. Jesus rose from the dead. The Bible story Jonah and the Whale is meant to deliver that message. It was written many centuries before Jesus lived, but, it was written to direct people to the coming Messiah and his resurrection power. Listen to this key instruction about Jonah and the Whale from Jesus, who definitely believed the written account. Jesus said, "An evil and adulterous generation seeks after a sign (aka miracle), but no sign will be given it but the sign of Jonah the prophet. For as Jonah was three days and three nights in the belly of the whale, so will the Son of Man be three days and three nights in the heart of the earth. The men of Nineveh will stand up in the judgment with this generation, and will condemn it, for they repented at the preaching of Jonah; and behold, something greater than Jonah is here, i.e. the Messiah." (Matthew 12:39-41 NHEB). Jesus tells us to repent and believe, because he is the Lamb of God who died and rose again, so that we could do the same. Will you believe? Will you repent? Will you stop your sinning? If you want Jesus for an eternity, Jesus will make sure you find Him. Seek, and you shall find the Savior. Jonah ran, but God used him anyway. God is always working and no rebellious man, such as Jonah, will thwart God's plans. You can run, you can hide, you can ignore God; but, if you're loved by him, like Jonah and the Ninevites were, than he will pursue you until the job gets done. If you're not being pursued by God, you should be shaking in your boots. It's a scary thing to live a life where God doesn't summon you to place your faith in him, or to work for him. God forbid. If this is you, stop the worthless things you're doing and pour out your heart and soul to the King. He loves you and is waiting for you to acknowledge him as Creator, Sustainer, Savior, and Lord over all. It's due time to come to God through Jesus. You may have forty days, but you may not. No telling. Repentance basically means you get one more chance. You're not guaranteed two, three, or more chances at repentance, but one more chance. Don't be a fool. Listen to Jonah and the Ninevites. You know what to do: Sinners Prayer. 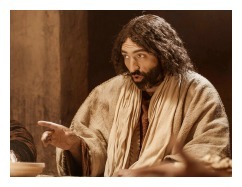 Next Bible study lesson: Jesus' Miracles #6.05. 1) Why did Jonah run from God's assignment? (see Jonah 4:2). What truths of God's nature did Jonah cite in his discussion with him? (see Jonah 4:2). 2) What main lesson did God's movement upon the Ninevites prove? (see 1 Timothy 2:3-4). 3) There are so many Christian lessons involved in this story, but, which is MOST important? (see John 3:16; 5:24-25). "An evil and adulterous generation seeks after a sign, and there will be no sign given to it, except the sign of Jonah." Jesus left them, and departed. Matthew 16:4 NHEB. "This generation is an evil generation. It seeks after a sign. No sign will be given to it but the sign of Jonah. For even as Jonah became a sign to the Ninevites, so will also the Son of Man be to this generation. The Queen of the South will rise up in the judgment with the men of this generation, and will condemn them: for she came from the ends of the earth to hear the wisdom of Solomon; and behold, one greater than Solomon is here. The men of Nineveh will stand up in the judgment with this generation, and will condemn it: for they repented at the proclaiming of Jonah, and behold, one greater than Jonah is here." Luke 11:29-32 NHEB. The book of Jonah is much more than a fish story. It is a beautiful account of God's grace that lifts our sights to the greatest love story of all - the death of his Son Jesus Christ for the sins of the world. FF Bruce. O Lord God, merciful One, Redeemer of ALL mankind, I bow before you. I worship your holy name. You are the Creator, the lover of those who bend the knee before you. Thank you for your patience, kindness, and mercy you show us, Father. Jesus, thank you for calling us, and answering our prayers and devotion to you. Save us completely from the coming wrath that's intended for all sin and sinners. In Christ's name, Amen. Share on Facebook below and click for your Free Printable Bible Study Lesson: Jonah and the Whale #6.04. Click here to download your free printable List of Old Testament Miracles; and List of Miracles of Jesus. Special Note: I'm grateful to Big Book Media & Free Bible Images, stock.xchng, Morgue Files, and Stock Photos For Free for the use of their photos for the Jonah and the Whale Bible Study Lesson.